A thorough understanding of the literature generated from research in care homes is required to support evidence-based commissioning and delivery of healthcare. So far this research has not been compiled or described. We set out to describe the extent of the evidence base derived from randomized controlled trials conducted in care homes. A systematic mapping review was conducted of the randomized controlled trials (RCTs) conducted in care homes. Medline was searched for “Nursing Home”, “Residential Facilities” and “Homes for the Aged”; CINAHL for “nursing homes”, “residential facilities” and “skilled nursing facilities”; AMED for “Nursing homes”, “Long term care”, “Residential facilities” and “Randomized controlled trial”; and BNI for “Nursing Homes”, “Residential Care” and “Long-term care”. Articles were classified against a keywording strategy describing: year and country of publication; randomization, stratification and blinding methodology; target of intervention; intervention and control treatments; number of subjects and/or clusters; outcome measures; and results. 3226 abstracts were identified and 291 articles reviewed in full. Most were recent (median age 6 years) and from the United States. A wide range of targets and interventions were identified. Studies were mostly functional (44 behaviour, 20 prescribing and 20 malnutrition studies) rather than disease-based. Over a quarter focussed on mental health. This study is the first to collate data from all RCTs conducted in care homes and represents an important resource for those providing and commissioning healthcare for this sector. The evidence-base is rapidly developing. Several areas - influenza, falls, mobility, fractures, osteoporosis – are appropriate for systematic review. For other topics, researchers need to focus on outcome measures that can be compared and collated. Care homes provide accommodation, together with nursing or personal care, for persons who are or have been ill, who have or have had a mental disorder, who are disabled or infirm, or are or have been dependent on alcohol or drugs . In the UK, 91 % of residents are over 70 years of age, 76 % require assistance with mobility or are immobile and 78 % have at least one form of mental impairment . In some countries, such as the Netherlands and USA, health care professionals are based within, or employed by, care homes [3–5]. In others, such as the UK or Ireland, the health care provision for care homes is provided by generic primary care services. The provision of health care to this sector is a matter of concern, debate and innovation [4–8]. Quest for Quality, a document by the British Geriatrics Society , stated that health care for care homes in the UK was characterised by “unmet need, unacceptable variation and often poor quality of care”. To improve matters, the report recommended the development of a more structured and evidence-based approach to commissioning. To inform this process, we set out to describe the extent of the evidence-base for the effectiveness of interventions specific to care home residents. We chose a systematic mapping review because these are specifically designed to describe the extent of research in a field [7, 8]. 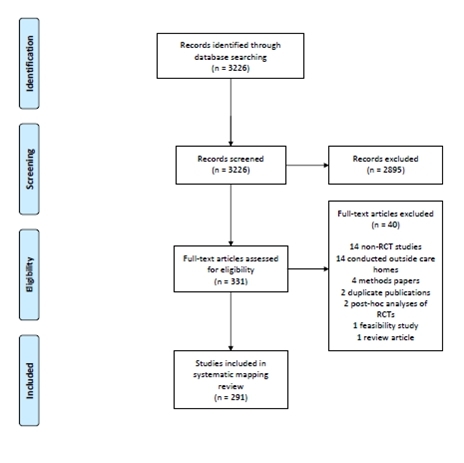 We chose to review only randomised controlled trials (RCT) so that the findings would represent the highest tier of medical evidence for therapeutic interventions . Medline (1950-Jun 2009) was searched for “Nursing Home”, “Residential Facilities” and “Homes for the Aged”, combined using the “OR” command. Results were limited for English language and RCTs. CINAHL with full text (1978-June 2009) was searched for “nursing homes”, “residential facilities”, “skilled nursing facilities”, with results limited to RCTs. The Allied and Complementary Medicine Database (AMED) (1985-June 2009) was searched for “Nursing homes”, “Long term care” and “Residential facilities” combined using the “OR” command and “Randomized controlled trial” using the “AND” command. The British Nursing Index and Archive (BNI) (1985-June 2009) was searched for “Nursing Homes”, “Residential Care” and “Long-term care”. Abstracts were reviewed by a single researcher and articles included if they described interventions evaluated by RCT in residential, nursing or care homes. A keywording strategy  was developed by three researchers using an iterative approach and a random sample of 20 articles, which were reviewed repetitively with key descriptors recorded. The researchers met after each iteration and the process concluded when two subsequent reviews identified no new descriptors. The resulting framework described: year of publication, country of publication, individual or cluster randomization, stratified or non-stratified randomization, method of stratification, blinding strategy (patient/investigators/both/neither), target of intervention, intervention treatment, control treatment, number of subjects (total/intervention/control), number of clusters (total/intervention/control), outcome measures and results. The remaining articles were then divided amongst six reviewers who classified them according to the keywording strategy. As a final measure, all articles were reviewed by the lead researcher with disagreements resolved by consensus. The abstracts of the 3226 unique citations identified from the search were examined, 331 of which described RCTs in care homes. Forty of these were excluded at full review leaving 291 articles in this review. A PRISMA flow diagram is shown in Figure 1. The majority of studies (145) were conducted in the USA, followed by the UK (24) and the Netherlands (23): 163 articles came from the Americas, 87 articles from Europe, 23 from Asia and 16 from Australasia. 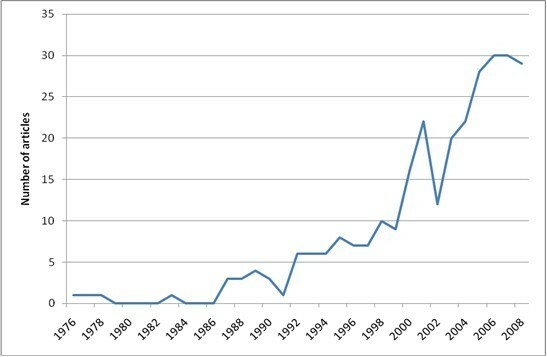 Figure 2, showing the publication rate by year, demonstrates a steady increase in the number of publications over the last two decades. The median age of the publications was 6 years. Number of articles published by year. Key methodological attributes of the studies are outlined in Table 1. 36 primary targets for interventions were identified, as summarised in Table 2. For interventions targeting resident behaviour, most pharmacological studies evaluated risperidone [22–26] or olanzapine [18, 19]. Two studies evaluated interventions aimed at withdrawal of antipsychotic medications [27, 28]. Studies listed under occupational therapy, aids and appliances targeting behaviour were heterogeneous and included Activities of Daily Living (ADL)-targeted interventions [29, 30], re-orientation , pet therapy  and music therapy [33–35]. Physical therapy studies evaluated either light therapy [37–39] or exercise therapy . Staff education interventions focussed either around communication [41–43] or goal-setting . Seven studies targeting prescribing of medications looked at incorporating pharmacist review, with or without physician involvement, into clinical pathways on or after admission to care home [55–57, 61–63, 65]. Other, more targeted interventions considered protocols for the withdrawal of hypnotics , neuroleptics [59, 66], anti-depressants  and anti-Parkinsonian  drugs. Two studies evaluated the effects of specific antibiotic protocols on prescribing [60, 64]. Six studies evaluated the impact of staff education on prescribing, three considered teaching on psychopharmacology [69, 70, 73], one on generic prescribing issues , one on antibiotics  and one on pain management . The majority of studies targeting nutrition evaluated nutritional supplementation using vitamin, mineral, and/or protein-energy supplementation [78, 79, 81–89, 93]. Three studies, all from the same authors, evaluated the effect of megestrol acetate on nutritional biomarkers [90–92]. Other studies evaluated the effect of flavour enhancers , dietary restriction , family-style dining arrangements [75, 129] and the provision of feeding assistance . Studies targeting influenza in residents predominantly compared doses or types of vaccine [94–96, 101, 102, 104–106]. Three studies compared influenza vaccination with placebo [97, 99, 100] and two with usual care [98, 103]. Six evaluated neuraminidase inhibitors [107–112]. Studies targeting quality of life were heterogeneous. Under this heading, studies evaluating psychological or behavioural interventions evaluated group or individual therapies to build self-esteem [113, 114] or reminiscence therapy [115, 116]. Occupational therapy-oriented studies to improve quality of life evaluated spectacle correction of eyesight, engagement in teaching and pets [117–119]. Physical therapy studies to improve quality of life evaluated tai chi, back rubs and functional incidental training [120–122]. Staff training interventions to improve quality of life evaluated teaching about end-of-life care, dementia management and conflict resolution [123–125]. Studies targeting depression evaluated exercise therapy [132–134, 136, 137], light therapy  and yoga . There were four studies of antidepressants [140–143], one of reminiscence  and one of self worth therapy . Interventions targeting mobility were much more homogenous. Ten physical therapy studies all evaluated forms of exercise therapy [148–157] while two of the three occupational therapy interventions evaluated multi-faceted mobility interventions [158, 159]. The final study evaluated visual feedback balance training . Oral health studies predominantly evaluated the role of mouthwashes, toothpastes and other oral preparations in dental hygiene [161, 162, 165, 166, 169] but also evaluated toothbrushing technologies and techniques [164, 170, 171], oral healthcare education [168, 172], restorative dentistry  and denture care . One study evaluated subantimicrobial doses of an antibiotic as a treatment for chronic periodontitis . The majority of studies that evaluated falls prevention interventions focussed on multifaceted programmes [174–179]. Two studies evaluated the role of vitamin D supplementation [180, 181] and two evaluated exercise therapy [182, 183]. One evaluated the role of care home governance in falls documentation  and one evaluated the impact of staff education on falls rates . Studies targeting quality of care focussed predominantly on care home administration: four examined quality assurance programmes [189–192], two the implementation of advanced care planning or advanced directives [186, 187], one communication with families  and one resident relocation . The remaining studies evaluated the impact of staff education on bathing , communication  and death and dying . Of the less frequently studied areas, large cohorts were seen in studies targeting fractures and osteoporosis. These areas were also notable for the similarity of the interventions studied and outcome measures recorded: all eight fracture studies evaluated hip protectors [225–232] and four [248–251] out of seven osteoporosis studies evaluated calcium and vitamin D therapy, with or without bisphosphonates, whilst a further study evaluated alendronate as a standalone therapy . Ten studies evaluated case management in the care home setting. The effect of psychiatric case management was evaluated in six studies, two on behavioural disturbance [49, 51], two on depression [51, 146] and two on quality of life [128, 197]. Four studies evaluated broader assessment and management taking account of somatic, psychological and environmental issues, which might be termed comprehensive geriatric assessment [48, 254, 255, 287]. One study evaluated protocol-driven disease management for COPD by care home nurses . These findings provide a unique resource for those providing health care to the care home sector, collating for the first time the range of interventions and outcomes that have been tested using RCTs specifically in care homes. There have been a considerable number of RCTs of interventions specifically in care homes (292 between 1974 and 2009). These studies are relatively recent, since half of them were published in the last 6 years. They evaluated a diverse range of interventions such as light therapy, staff training and oral hygiene and an equally diverse range of targets such as reducing falls, increasing weight or improving mood. The studies were mostly functional (44 behaviour studies, 20 prescribing studies, 20 malnutrition studies) rather than disease based (1 study each for UTI and COPD). Over a quarter of papers focussed on mental health or behaviour. Despite our use of systematic searching, we found no previously published studies that had collated this literature. A limitation of this review is the geographical distribution of papers, with the majority of studies arising from the USA and relatively few from non-English speaking nations, thus reducing the generalisability of the findings worldwide. Our decision to select only RCTs means that we have not collated the entire evidence base for interventions in care homes and are likely to have missed several important studies as a consequence. Such studies would include those focussing on policy, facility organizational characteristics and the ways in which care homes interact with other care services, including the health service – these have been recognised to be important drivers of care quality but have been studied by means other than RCT . It is possible that staff trained in the care home setting – as some doctors are in the Netherlands or USA – are aware of many of these studies but it is less likely that those who provide health care to care homes as part of generic primary care will be familiar with them. The recent growth in the number of papers means that even health care professionals with an interest in the area will be out of date if they have not recently consulted the literature. The wide-ranging nature of the studies identified will have relevance to commissioners, and health care professions including general practitioners, geriatricians, psychiatrists, nurses, occupational, physio- and speech and language therapists, dieticians, dentists, pharmacists and social workers – as well as care home staff. From a research perspective, there were few targets where multiple studies evaluated similar interventions against a common outcome measure. The obvious exceptions were influenza, falls, mobility, fractures and osteoporosis and these areas are suitable for systematic reviewing. There was great diversity of interventions and targets, such that there were few papers using the same intervention and the same target. Thus, despite the large numbers of papers found, much work remains to be done to develop a robust evidence-base for each intervention and each target. Although a detailed methodological critique is beyond the scope of a systematic mapping review, the fact that the majority of studies were unblinded and did not employ cluster randomization means that many will have been methodologically flawed. In summary, these findings represent an important resource for commissioners, clinicians and researchers involved with care homes. At the very least, the diversity of interventions and outcomes illustrated should challenge nihilism towards this health care sector and encourage further innovation. This article presents independent research commissioned by the National Institute for Health Research (NIHR) under its Programme Grants for Applied Research funding scheme (RP-PG-0407-10147). The views expressed in this publication are those of the author(s) and not necessarily those of the NHS, the NIHR or the Department of Health. The authors would also like to acknowledge the support of the British Geriatrics Society, who provided an SpR start-up grant in support of ALG at the outset of this project. The Medical Crises in Older People study group also includes: Isabella Robbins, Jane Dyas, Justine Schneider, Sarah Goldberg, Rowan Harwood, Kathy Whittamore, Sarah Lewis, Simon Conroy, Anthony Avery, Fiona Jurgens, Judi Edmans, Lucy Bradshaw, Helen Boardman, Rachel Elliot, Matt Franklin and Davina Porock. ALG was lead researcher and also lead author. JRFG and PAL contributed to the development of the keywording strategy. All authors participated in the literature review and contributed to drafting the final manuscript. All authors read and approved the final manuscript.